Here is a cake I baked while I was in Spain. I won't lie to you, I didn't make the base from scratch.. it was a cake mix. Yes, I can be lazy at times. But there are some really good bases out there, and if you really want to make one from scratch, I can make you a recipe for that too. Obviously, the kind of fruit you will use on your version, will depend on what's available to you. 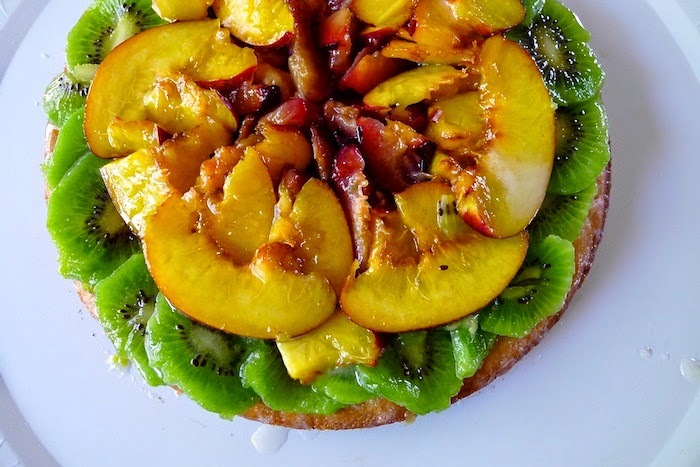 Here I used plums, peaches and kiwi. My little brother loved it so much, he had a second huge slice. Top off with a drizzle. I used lemon juice mixed in with powdered sugar, and voila! Ok, now I'm having crazy craving too, oh woe.